Michelin Latitude Tour HP tires offer a combination of all-season traction and handling to go with a comfortable ride all year round. With a unique tread compound, the Michelin Latitude Tour HP performs well on dry, wet or light snowy surfaces. Michelin has incorporated what it terms Secure Lock Tread Block Technology. According to this feature the tread provides good traction by keeping itself open. In the event that you need to stop suddenly or get heavy on the brakes, the tread closes and become more stiff and solid to assist in good support for the vehicle. The same occurs during brisk acceleration and sharp cornering when the tread closes again. All of this combines to increase steering response and adds more confidence behind the wheel. The Latitude Tour HP has a solid center rib which provides better control and ensures better fuel mileage through lower rolling resistance. Road noise is minimal which means that you do not need to shout in order to be heard at high speeds on the highway. Driving through heavy rain is made safer due to the circumferential and lateral grooves that enhance traction and reduce the risk of hydroplaning. Inside the tire, Michelin has used twin steel belts and its Filament AT Zero Technology to surround the tread with a polyamide strand to ensure longevity of the tread which gives the tire a longer tread life. Overall the Michelin Latitude Tour HP Tire provides very good handling and traction on all types of road surfaces and weather conditions. The ride is comfortable and is without the road noise you experience with many other tires. 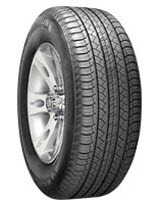 The Latitude is accompanied with an excellent warranty, making this model a solid choice in SUV or light truck tires. Who Are Michelin Latitude Tour HP Tires Designed For? The Michelin Latitude Tour HP tires are for drivers of SUV’s and Crossovers who are wanting a good performing all-season tire that is also quiet and comfortable to ride on. Michelin backs up the Latitude Tour HP tire with a 6 year or 55,000 mile warranty on H and V speed rated models, and 6 years or 45,000 miles on W,Y and Z speed rated tires. You’ll also find a one-year or first 2/32 inch of wear on the tire’s uniformity. Materials and workmanship are covered for 6 years and call for a free replacement in the first year or first 25% of wear. Michelin follows that up with a prorated amount down to the last 2/32 inches of useable tread depth. Finally, there is also a 3-year flat tire changing guarantee included, as well as a 30-day customer satisfaction guarantee.